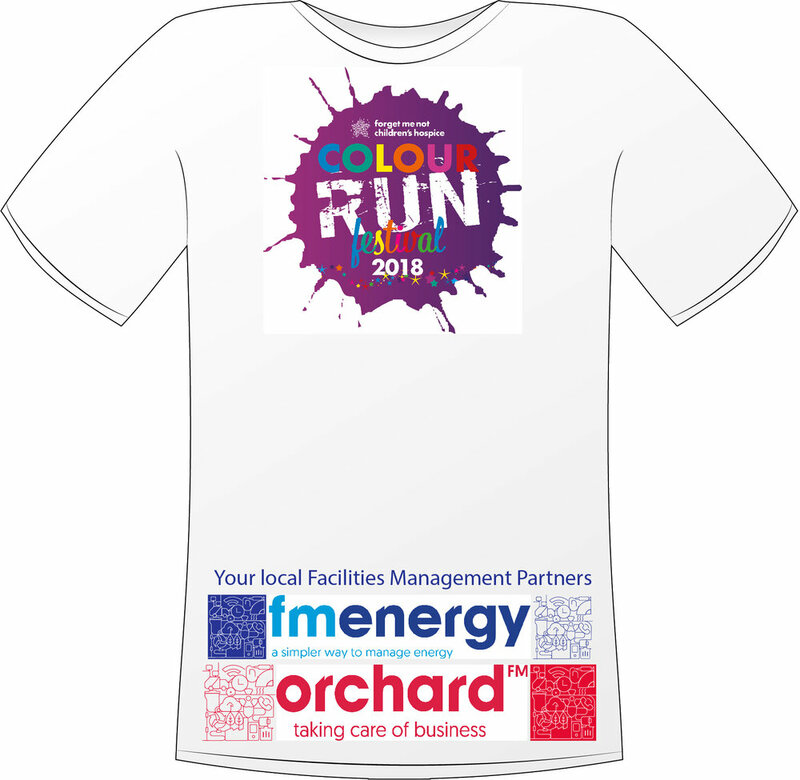 Huddersfield facilities management specialists Orchard FM and FM Energy have joined forces to provide festival shirts for all those taking part in this year’s Forget Me Not Children’s Hospice Colour Run. FM Energy has also been announced as the charity’s new energy management and brokerage partner, building on a long-term partnership with Orchard FM which has enabled the hospice to manage its costs over many years. Gareth Henderson, founder of Orchard FM and FM Energy said the sponsorship recognised a long and fruitful relationship with Forget Me Not Children’s Hospice, dating back to its earliest days before Russell House was built. “We have been inspired by the passion and commitment of everyone involved in the charity since we first became involved all those years ago,” said Gareth. Orchard FM offers complete estates and facilities management services for businesses and organisations in Calderdale and Kirklees including maintenance, compliance, waste and recycling, IT and data security. FM Energy was recently launched to provide energy purchasing, efficiency and bill management services to further help local firms manage their costs. Forget Me Not provides care and support to local children with life-shortening conditions and their families in West Yorkshire. There is still time to pre-register for this year’s event which will include entry into the Festival Zone with family entertainment, music, face painting, street food vans and more. Pre-registration closes on Friday June 15 but on the day registrations are also accepted. Participants can run, jog, walk or dance their way around the 4K rainbow route at Farnley Estate on June 30 wearing the t-shirts featuring the dual logos of both businesses. A Leeds charity has tackled burglary and crime at its 125 acre site by outsourcing its site security to a Yorkshire company that specialises in delivering facilities management support to charities. Orchard Facilities Management in Huddersfield works with charitable organisations across the region including Forget Me Not Children’s Hospice, Overgate Hospice and Christians Against Poverty. Its latest project with Caring For Life was prompted by a series of major burglaries at the charity’s headquarters in Cookridge, where it runs therapeutic daytime activities for the homeless and vulnerable people who are supported through its housing projects. Tim Parkinson of Caring For Life said: “As a charity we don’t want to have the responsibility of keeping our site secure and making sure everyone on the premises is kept safe – we just want to come in each day ready to deliver care. “By outsourcing that responsibility to Orchard our HR staff no longer have the headache of managing rotas to make sure the site is supervised out of hours and covering for absence. If we have a problem we ring Orchard and they sort it out for us. Tim said a decision by Orchard FM to change security supplier at the last minute had demonstrated outstanding customer care. “We had agreed on a supplier with Orchard but before contracts were signed their team flagged up the fact that they had concerns about the honesty and transparency of the company concerned,” Tim explained. Orchard FM is an SIA Approved Contractor, putting it amongst the best providers of private security in the UK, guaranteeing clients the highest possible standards of customer service and safety. Orchard’s site security services include providing trained and vetted security personnel on site to protect our customers’ premises, goods and staff and offering round the clock security and cover for specific high risk periods such as overnight. Gareth Henderson of Orchard FM said: “Caring For Life differs from many commercial sites in that it extends across more than 100 acres, made up of farmland and workshops as well as restaurant, retail and office premises. We are proud and delighted that our team has been recognised with a very special award at Forget Me Not Children’s Hospice’s second Celebration Soiree. The event at The Arches, Dean Clough, was all about celebrating strong partnerships between the hospice, its friends, fundraisers, supporters and volunteers. It was a really fun evening with a rat pack theme and live swing music. Orchard FM and Forget Me Not Children’s Hospice have enjoyed a close partnership throughout the charity’s journey from early fundraising to its growth into an active and vital service for families in our local community. We are also founder members of Forget Me Not’s 99ers Business Club and actively encourage other local firms to get involved. Our partnership goes even further than this and we are pleased to be able to support the hospice as it facilities management provider, keeping things running smoothly and minimising operational costs as much as possible so that more money can go into delivering care. We are proud of the strong partnership we have developed with Forget Me Not and we are looking forward to maintaining close links in the years ahead. The award means a great deal to our teams and we are thrilled to have been recognised in this way. Read more about how we work with Forget Me Not Children’s Hospice.